Most dogs spend about 14 hours a day sleeping or napping. The exact amount of sleeping time depends on the dog’s breed, personality, and age. For example, large breeds might need closer to 18 hours of sleep a day while smaller breeds can get as little as 10 hours. But just because dogs can sleep for over 14 hours a day doesn’t mean their quality of sleep is any less important than yours. Here we will show you how bean bag dog beds help your dog get a healthier night’s sleep. What Happens If a Dog Doesn’t Get Enough Sleep? Dogs must get a certain amount of REM sleep every day to help reduce stress. When dogs are introduced to fight or flight situations during the day, they release the stress hormones adrenaline and cortisone. Dogs then eliminate these stress hormones when they’re in REM sleep. When dogs don’t get enough REM sleep, they’re unable to remove the stress hormones from their bloodstream. That means the hormones continue to affect their behaviour when they’re awake. A sleep-deprived dog will have trouble controlling natural impulses, meaning their behaviour could be more aggressive. During natural sleep, a dog’s pineal gland releases melatonin, which helps regulate a dog’s biological clock. Melatonin also strengthens a dog’s immune system, so a dog that doesn’t get enough sleep may not be as healthy as other dogs. How Can You Tell Your Dog Is in REM Sleep? You can tell if your dog has entered REM sleep they start to move their legs and feet, make whimpering sounds, or otherwise move around in their sleep. You may also see their eyes moving behind their eyelids. In this stage of sleep, their heart will beat faster, and their breathing will quicken or sound irregular. But this is natural. Adult dogs should spend 12% of their time sleeping in the REM stage. Why Are Bean Bags Good Beds for Dogs? Bean bag dog beds promote healthy sleeping patterns in dogs. They are both a comfortable and safe sleeping place. Your dog may want to have some privacy while they’re sleeping, and because a bean bag bed make them feel secure and supported, it gives them that feeling of intimacy. But not every bean bag bed is good enough for your dog. What Kind of Bean Bag Does My Dog Need? You can’t just buy any bean bag bed for your dog. Because low-cost bean bag dog beds use cheap materials, they’re not going to stand up to your dog. And a higher price doesn’t mean the bean bag is any stronger. There are a few things you have to consider before buying a bean bag dog bed that come down to more than just cost. Here are a few examples. 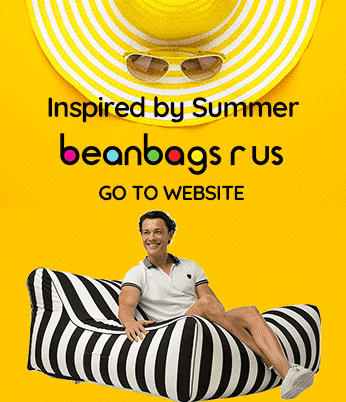 Cheap bean bags tend to use 420D polyester, which isn’t durable or comfortable. When it comes to dog beds, you’ll want to find one made of Nylon because it is a stronger fabric than polyester. Though cheaper nylon bean bag beds use 420D nylon, 600D nylon is more durable and suited for dogs. Remember, the higher the denier, the stronger the fabric, so if you can get 1680D Nylon or Polyester, that is super tough. Natural materials like cotton canvas can also be extremely tough. Nylon also water resistant, doesn’t stain easily and feels more lightweight than heavy duty polyester. Make sure the bed uses double-stitched, heavy nylon thread that will hold the bed together better and allows you to repair the product should it start to fall apart. The most comfortable bean bag beds for your dog are either round or oval shapes, rather than rectangular. Circular beds hold their shape better than rectangular beds. That means you don’t have to spend as much time trying to make the bed more comfortable by fluffing it up. Round beds also have fewer seams. Corners are easy for dogs to tear and chew, so your circular bed might last longer. You don’t have to worry about the size of your dog bed as much when you’re shopping for a bean bag. Choosing the correct size of your dog bed is crucial, so make sure the bed isn’t smaller than your dog! As long as the bed is a little bigger than your dog, the size will be superb. Bean bag beds shape themselves to support the size and weight of whatever dog is using it. Fillings like dry rice or seed husks can get lumpy, sharp, or uncomfortable. They also absorb water, which means they won’t last very long. Virgin EPS beads are made of polystyrene (a type of styrofoam) and have been designed especially for filling bean bag beds. They are also more durable than other alternatives and can last up to a year before you have to replace them. Dogs enjoy sleeping on bean bag beds, but not because of the material. Sleeping on a bean bag bed gives dogs a lot of other benefits. Take a look at all the ways a bean bag bed can make your dog feel comfortable. Some dogs, especially smaller breeds, have trouble jumping up and down from beds that are too far off the ground. 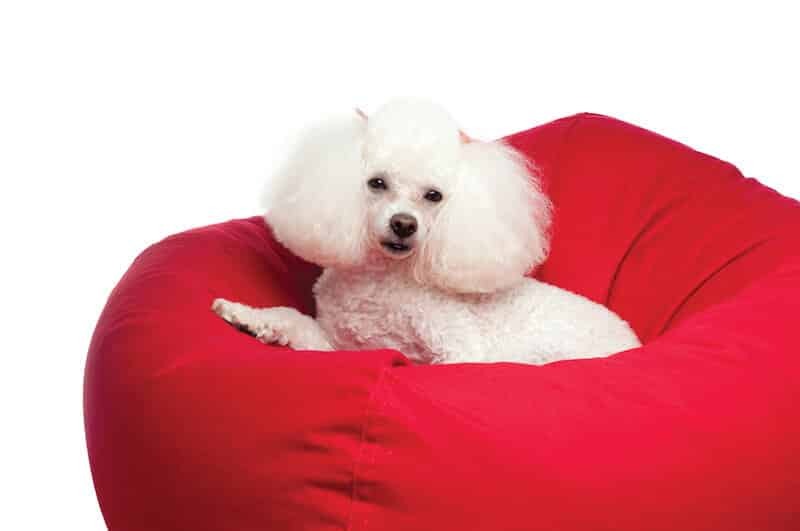 Bean bag beds give your dog a comfortable place to sleep that’s easy for them to get on. Now their options are the bed or the floor. If you choose a bean bag bed designed for dogs, they’ll be able to withstand scratching and biting. They don’t stain easily, so dogs that eat on their beds won’t leave you with a bean bag that looks filthy. These beds can also handle outside weather. You can put one in the backyard without it falling to pieces. Many bean bag beds come with a removable cover. When it gets covered in dog hair, dander, dirt, food, etc. you can remove the top-piece, throw it in the wash, and have a clean bean bag bed again. Machine washable dog beds make them excellent choices for both inside and outside beds. Bean bag beds insulate your dog from the floor temperatures. The beans keep the bed from getting too hot or too cold. That means they can sleep comfortably during both the winter and summer months. Bean bag beds provide support for joints and bones. Many experts recommend these types of beds for dogs that have related health problems. Bean bag dog beds are comfortable, durable, and safe. Worried about them getting covered in pet hair? Just take off the cover and wash it. Worried it wouldn’t be able to handle the outdoors? Many bean bag beds come with extra protection that makes them suited for outdoor weather. Ready to buy a bean bag bed for your dog? Take a look at our exclusive range of dog beds.